The thing about living a life of excuses is that it kinda gives you no options. You literally put yourself into a mental hole and then wonder on how earth you got there. The truth is that starting each sentence off with an ‘I can’t’ leaves no room for the ‘can’s’. It’s easy to allow your lack to hinder your journey. I know all about basing your next move on what you don’t have right now, and feeling pretty stuck. Mole hills are suddenly the size of Mount Kilimanjaro and all I want to do is throw a million pity parties for myself. Are you like me? Well, I think that both you and I need a double dose of Nick Vujicic’s book titled ‘Be The Hands And Feet’. Nick is a well known Australian motivational speaker who was born with a rare disorder called tetra-amelia syndrome. This condition rendered him limbless… yes, he has no arms and no legs. Nick explains how he’s never allowed his disability to affect his ability. Even though he’s unable to do certain things that an able-bodied person could do, he still went on to become a successful business man, popular speaker, radio talk show host, husband and a father! In ‘Be The Hands and Feet’, Nick shares tips on how to become an agent of inspiration and hope. You guys, the first part of the book is actually called “Letting Your Light Shine”! Uhm, yes please! You guys that that’s been my motto since like, birth. (Yes, I am being slightly dramatic). Anyways, in the first part he shares his testimony and how he believes that he was called to share the Gospel and make a change in the world – and having no arms or legs helped him to do just that! In the second part, called “Build The Team”, he talks about how to become a mentor and gives solid advice on how to plan for success, against all odds. The third part, “Finish Well”, is a beautiful memoir to his father. He shares about how his father was a role model to him and shares personal stories and victory’s about his dad’s battle with cancer. Win a copy of Be The Hands and Feet! 1. Compulsory: Make sure you’re following the blog – it’s how I get your email address, to let you know that you’ve won – and drop me a comment below to let me know that you’ve entered! You can subscribe via the little subscription box on the top right hand corner of this page. 2. Bonus: Grab an extra entry by tagging your friend in the Facebook post. 3. 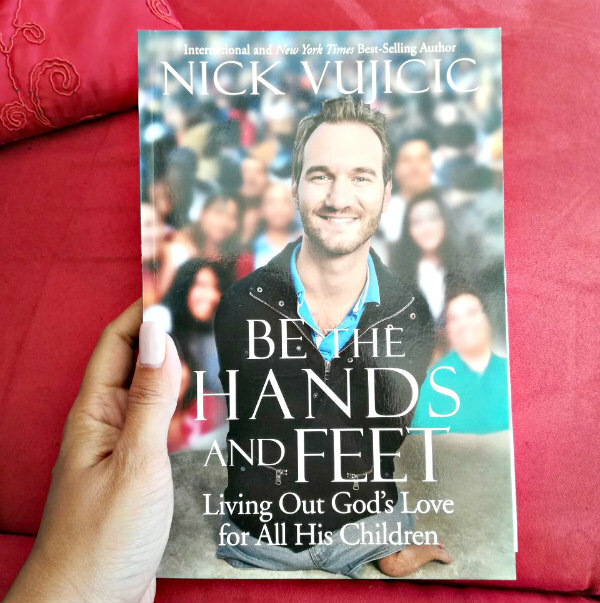 Bonus: Grab another entry by tweeting: Guys, I’m so excited to enter @luchaewilliams of #myspreadsheetbrain @CArtMedia #giveaway, to win a Be The Hands And Feet book, written by the amazing Nick Vujicic! The winners of all my April ‘Be The Light’ giveaways will be announced on my Facebook page on April 30th! Aaack! Will be a absolute pleasure to read this inspiring book. Entered via Twitter & Facebook. Wow…. if I don’t win it, I must go and buy myself a copy! I would love to read this book ,Entered!